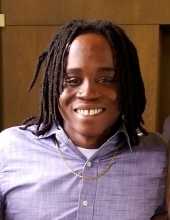 Andrew James (AJ) Hurley-Boyd age 26 of Ankeny, Iowa, passed away March 28, 2019. AJ was born in Iowa City, Iowa and lived in many different cities in Iowa. Survivors include his parents; Kevin Boyd and PJ Hurley of Windsor Heights. His five sisters; Rebecca, Elizabeth, Madelene, Katherine, and Margaret, three brothers; Spencer, Christopher, and Nicholas. His girlfriend and life partner Alana Morrow, One nephew Khamani, Grandparents Ginny and Pat Hurley. He leaves behind many aunts, uncles, cousins, and a large group of friends. He was preceded in death by his grandparents; Ida and Ole Boyd, Aunt; Sue Thompson, and his best friend Edmanuel (Manny) Perez Bruno. In lieu of flowers, memorials can be made to AJ’s family. To send flowers or a remembrance gift to the family of Andrew Hurley-Boyd, please visit our Tribute Store. "Email Address" would like to share the life celebration of Andrew Hurley-Boyd. Click on the "link" to go to share a favorite memory or leave a condolence message for the family.